Those of you who subscribe to my blog via email or somehow grab the RSS feed [thank you!] were treated to an unwitting peek behind the scenes one week ago when the rough draft version of this post went live without my awareness. When I was plotting out the pizza posts for July I’d tentatively scheduled this one for the first Friday. Then I thought of fireworks, changed my mind, finished up the Pepperoni and Yellow Squash pizza and scheduled it for the same day. I didn’t notice that I still had the draft of this pizza scheduled for later the same day, and didn’t even check that the pizza had posted properly when I first woke up. Nope, I went about my July 4th—packing and traveling to visit family, not even checking email until late afternoon when I was surprised to see the draft was live and sent out in my RSS feed. Oops! Fresh Tomato Pesto is easy to make, stores well in the freezer, and can be used as a dip for chips or vegetables, a pasta sauce, or on pizzas. 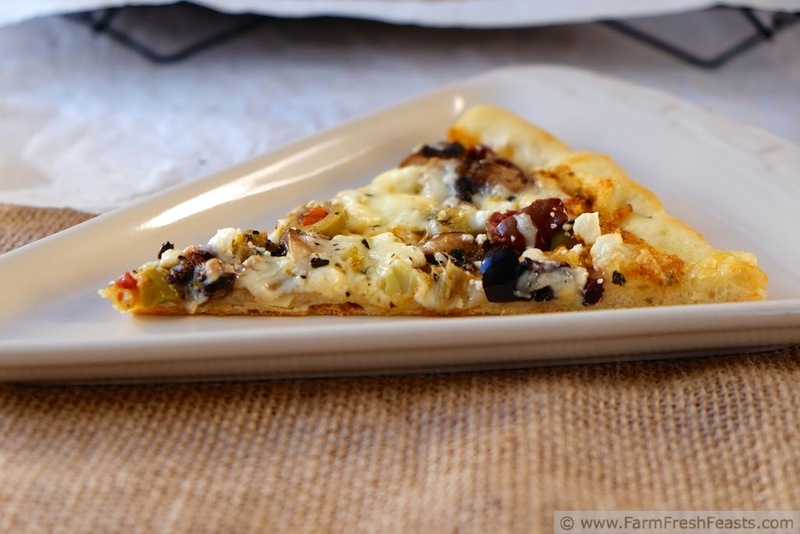 I’ve been sharing a lot of meat pizzas lately [just updated my Visual Pizza Recipe Index] and it’s past time for a vegetarian one. Preheat oven to 425 degrees Fahrenheit. If you've got a pizza stone, just leave it in there, you won't really miss the inch of vertical space it takes up except for Thanksgiving Turkey or Easter Ham time, and if you're a vegetarian . . . well, easy peasy then, right? Use a cookie sheet if you don't have a pizza stone. 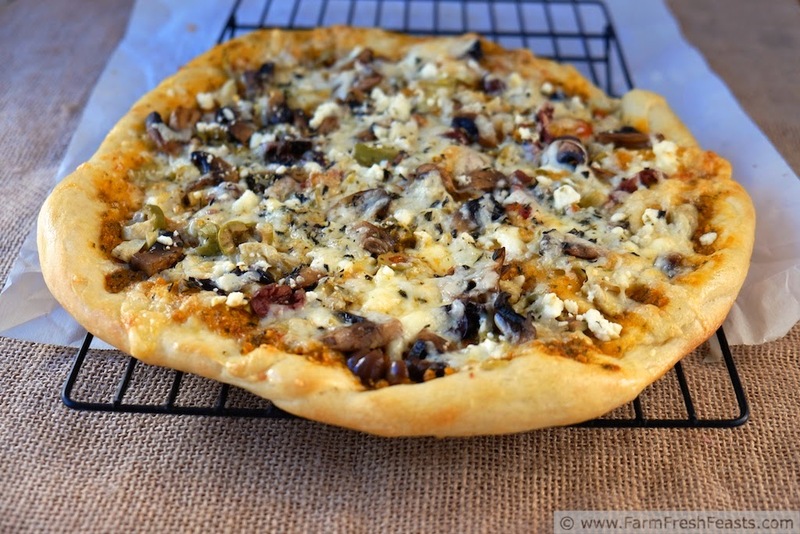 On an oiled piece of parchment spread out dough to the shape that rocks your world. Spread pesto to the edges [if using previously frozen pesto, drain the accumulated liquid off the top first]. 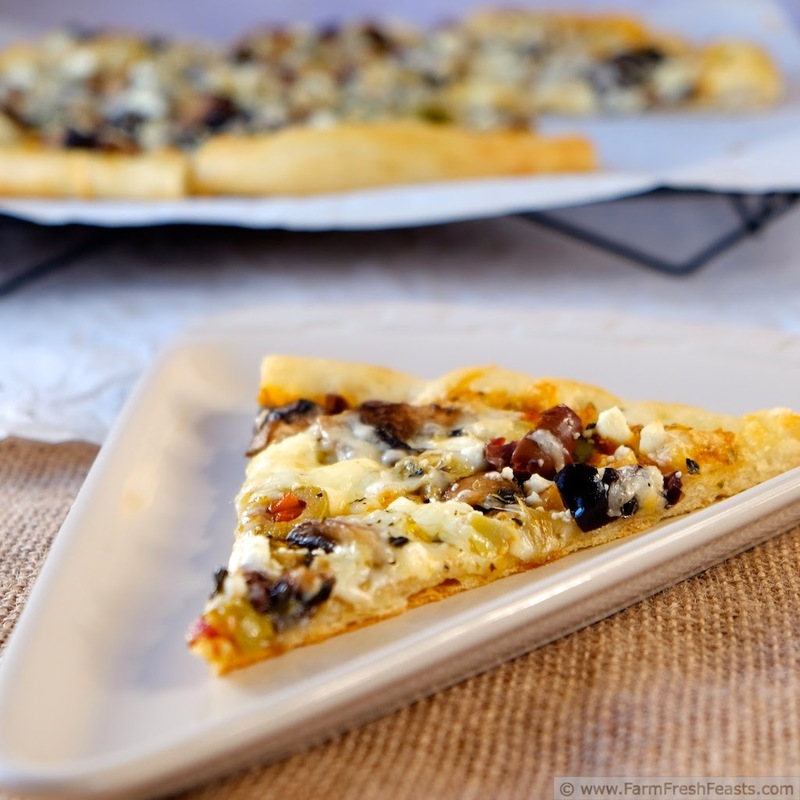 Top with artichokes, mushrooms, olives and feta cheese. 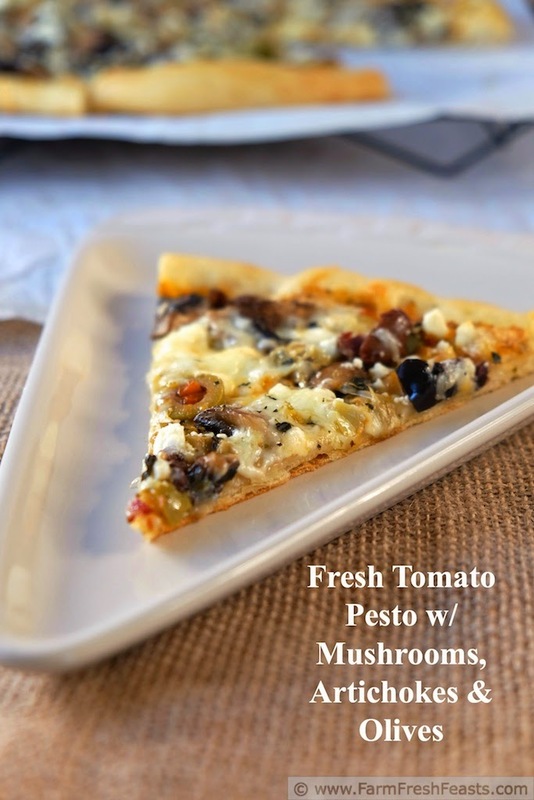 Top with fontina cheese. 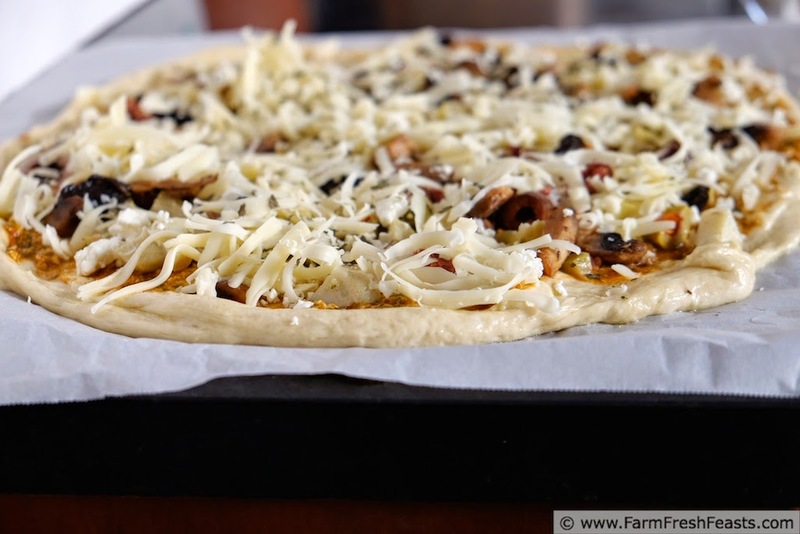 Bake on the parchment for 5 to 8 minutes, until the crust has firmed up and slides easily off the parchment. 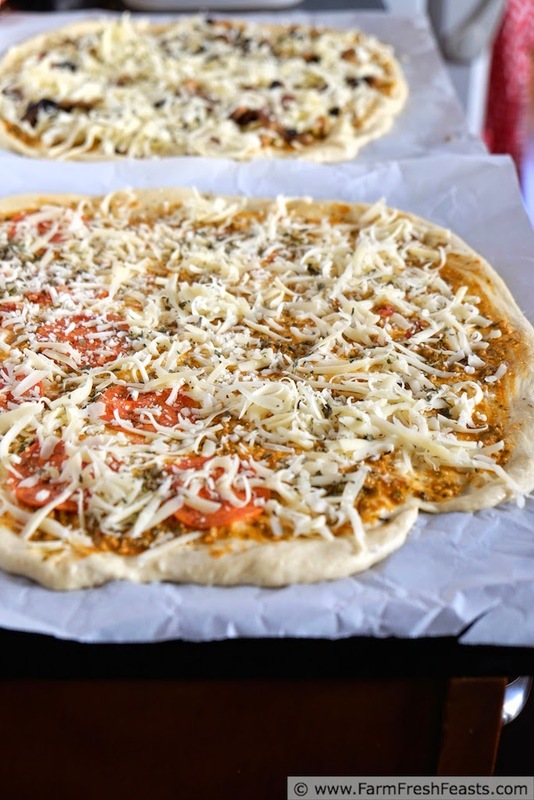 Bake directly onto the pizza stone for another 3 to 5 minutes until the cheese is browned and bubbly. All the more mushrooms for you!